Habitat: Woodland, hedgerows, towns, parks and gardens. 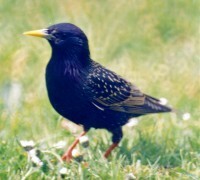 The starling looks similar to a blackbird from a distance, only smaller. However, on closer inspection they are very glossy with a sheen of purples, blues and greens, with specks of white or buff in winter. This is one of the commonest garden birds and they are often seen in flocks.